Whether you are new writer or an experienced blogger, you always find yourself in hot waters as to which topic you start writing. This is not something which is unique to you. All the bloggers face the same trouble on a daily basis. In fact, finding new ideas for the topic is very tough job. In order to solve your problem, you might have searched for various search terms in Google but mostly you do not provide the exact help you need. 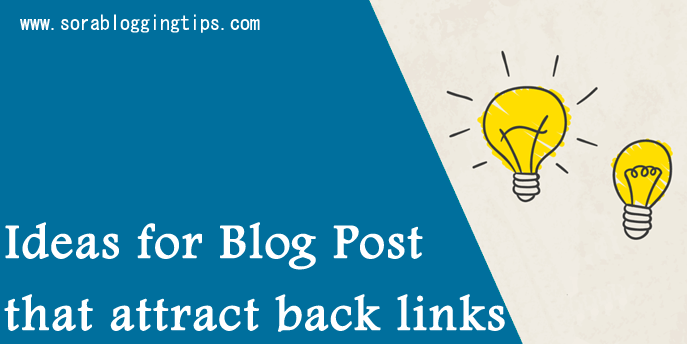 Apart from just finding the topic to write about, you need to find ideas which actually attract back links to your blog post as well. Keep in mind that people will love to share posts or contents which they like most. If your stuff is just an ordinary one, then your readers will not take time to share it. As everyone in this world, does not have free time. Like me, one will only share or bookmark content if he or she wants it to remain in their record for later viewing and reading. So, brainstorming is the key to success and to attract visitors to blog. Before going to read further, I advise you to install Ahrefs Toolbar because in this post, we will be using it for variety of purposes. Use Google to search for your topic + “infographic”, it will come up with top Infographics results in your related niche. In order to get best result, you need to activate the Ahrefs Toolbar which will show the number of back links just beneath each result. By analyzing the top results, you can easily determine the keyword or topic for your posts. You may extend your search by adding one or two keywords like that accounting or finance + “infographic” to get more ideas to write about. Using the power of Google search, you can also try this method by entering Keyword + “ *lists”. This will pop up the results within your niche that is attracting visitor’s attention. Here the Ahrefs toolbar also plays a key role as it shows the top sites with number of back links. By analyzing the list, you can write your own content but make sure you write better than the top results so that visitors find something new in your post and link back to it where ever they can. Majority of the visitors love to read and apply actual strategy that is working. That is why; case studies are in demand now-a-days. In order to take advantage of this, you need to use again the Google search option. Just enter Keyword + “case study”. Now it is your turn to identify the case study results which are getting most of the back links. Now, use these case studies to write your new high quality unique posts so that visitors/ readers to your blog share it with a back link. People love to watch and read their favorite personalities. So, it is the best idea to search for people who has roots in the public. Try to arrange a time with them for the interview. Not only, people will come over your blog to read or watch their interview, but the interviewee may also put a link to your blog post about his or her interview. This will not only drive traffic to your blog but a link back to your blog post as well. This is the most effective strategy. Here you need to search for broken links in your niche. After accumulating the broken list, you need to write a high quality master piece which has real importance to the readers or visitors to your blog. Now, after posting the masterpiece, just ping the other webmaster about the broken link with your blog post’s URL. I have tested this technique and found around 80 % bloggers like to link back to you if you help them in identifying a broken link. Quora is the best place to get new ideas for your blog post. In order to take full edge using this, just go to Quora website. Now in the search field, enter your niche or keyword, upon search completion, watch out for results. Results which have higher number of followers are the best topic or keywords for your blog writing ideas. Please keep in mind that does not just rephrase the content in your blog post as this will not attract visitors to link back to you. Instead, try to introduce unique and valuable information in your posts which is not imparted anywhere else. This will push up readers to your blog; share and link back to you where ever possible. It is assumed to be the old method but still it is the very effective tool to get new ideas for your blog posts. You need to search Google for Keyword + “forum” to identify top forums/ discussion boards. Then search these forums and identify the threads which have the maximum number of views and replies. Now, you can use these to develop the topic of your post. Not just that, Discus community is another best place to search for your niche. After identifying the top communities there, you may determine the topic for your blog post. You may also take support from Face book as well. Join groups similar to your niche and look out for what people are sharing and requesting for information. Now determine how you can fulfill their information needs by writing an informative post. If your readers/ visitors find your posts valuable and informative, he or she will definitely link back to it and will share with others in the Face book. This will increase your social share metrics in the eyes of search engines especially Google. It is always a good idea to keep a word file created for storing your brainstorming ideas and a separate file for the topic over which you want to create/ write the post. This way, you will have everything done in a professional way. I am hopeful that you have liked this post over New Brainstorming ideas for Blog Post that attracts back links.